I broke so many writing and grammar rules in those two opening sentences that I can barely bring myself to carry on. But I’ve also thrown in a red herring or two to accompany the genuine howlers. I wonder if you can tell them apart. Wherever there are rules, you’ll find two camps: one for whom those rules are paramount and must be adhered to at all costs, and another who say that rules exist for one reason only – to be broken. 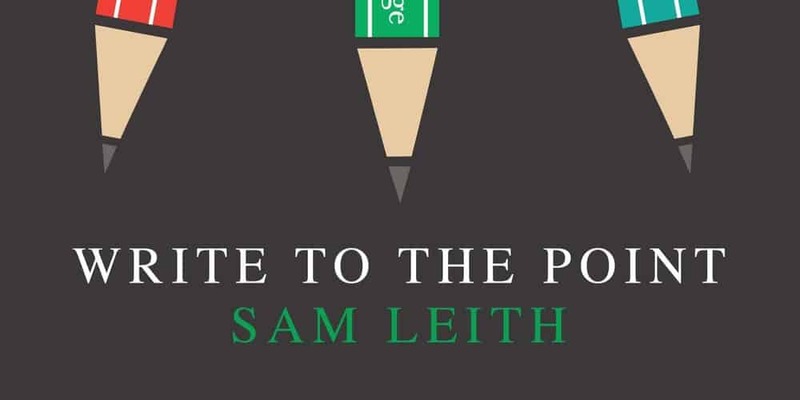 When it comes to writing, author, literary editor, journalist and novelist Sam Leith calls those camps the prescriptivists and the descriptivists. Promoting his book Writing to the Point at YCN this week, he compared the age-old struggle between these camps to trench warfare in the First World War. The prescriptivists – for whom he clearly has more disdain – would have us believe that grammar rules are etched in tablets of stone and must never be broken. The ‘hippy-dippy’ descriptivists, on the other hand, believe that anything goes; language is a living, ever-changing thing that should not be fettered in any way…man. Leith steers an eminently sensible middle course between these two warring factions. He acknowledges that the descriptivists are fundamentally correct – language does indeed constantly evolve, whether we like it or not – but that the prescriptivists have some good points to make, not least about precision and clarity. He believes a crisis of confidence lies at the root of much of the bad writing we see every day. People who are perfectly capable of stringing any number of coherent spoken sentences together seem to believe that they must adopt an alien voice when they start writing. They complicate and formalise their language to the point of gobbledygook in the misguided belief that this is what’s required if they want to be taken seriously. There are many ways to improve your writing – we explored a few in a recent blog post following another YCN event. Here are some more: Leith’s five golden rules to help you sharpen up your prose. Bait the hook – Fishermen bait their hooks with things that appeal to fish, not to fishermen. Writers should use language that appeals to their readers, not to themselves. Be clear – If, like most writers, you want to be understood by the maximum number of readers in your audience with the maximum ease, keep your writing plain and simple. Be correct – There’s no point breaking the rules of grammar for the hell of it – you’ll just alienate the prescriptivists. Leith argues for correctness ‘not because it’s correct, but because it’s effective’. Branch right – Sentences that offer a subject, verb and object early on and close together – known as ‘right-branching’ sentences – are easier to understand than those that meander through numerous sub-clauses before getting to the point…just look at the second sentence in this blog. This is all music to our ears here at Red Setter. We understand the need for clarity, simplicity and rhythm in our writing and we take pride in producing material that delivers on all fronts. In fact, we love clear and purposeful prose almost as much as we love great design. When we write, we are adept not just at baiting the hook, but doing so in a style and tone of voice that truly represents our clients. We understand the world of our design agency clients and we understand the media and we know how to present the first to the second in a way that truly works for everyone and generates great coverage.